Gliese 892 is the seventh nearest G-type star. At V = 5.5, it's visible to the naked eye. It was one of the targets of the first-ever radial velocity planet seach. It's not a well-known star, but it sure will be after this. Stalker wrote: isnt it better? Yes. New users are forbidden to give references at this forum. If you want to link for us your blogposts (I think you are welcome), please translate something as short and complet as an abstract. I can read and understand russian but i'm almost the only one. Stalker wrote: If you want to link for us your blogposts (I think you are welcome), please translate something as short and complet as an abstract. I can read and understand russian but i'm almost the only one. I do not know much English, so I will say that the slides are taken from video of the conference. It seems that the radius was not made public yet. The tableau seems tobe cropped from a PDF in the style of a peer review so I guess its in the processus of publication. They wouldn't bother announcing it if the publication wasn't ready, I imagine. 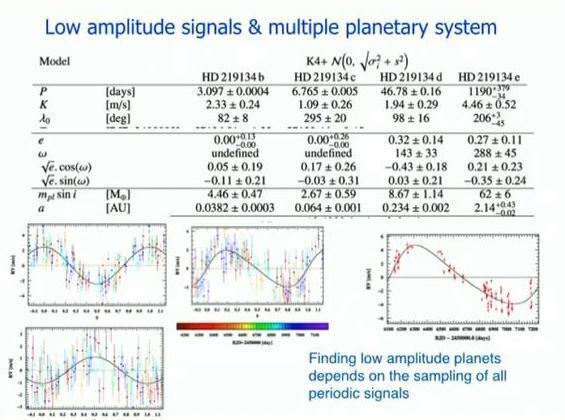 I haven't got to the part of the conference where they talk about the system yet, but inspecting the slides, it looks like there are 5 planets, not 6. I think the 1190-day signal in the first slide is the same as the 2334-day signal in the second, but the first is based on less data (only APF, I imagine)(Actually, that's HARPS-N). Shellface wrote: Gliese 892 is the seventh nearest G-type star. Wait a second, SIMBAD lists it as a K3V... and all the MK measurements also give K3V. Lazarus wrote: Wait a second, SIMBAD lists it as a K3V... and all the MK measurements also give K3V. Oh. Hah. It's been so long since I'd thought about that star that I misremembered its spectral type. It's the 14th nearest K-dwarf, I think. Whatever! It's 6.5 parsecs away. That's crazy! Glad to see more planets around nearby stars. Um, Wow! HARPS-N + Spitzer team up to give us a transiting rocky super-Earth around a naked-eye star. This is going to become a *very* well-studied planet (Three more planets were also found, making this a four-planet system). Same system as Gliese 892. Lazarus wrote: Same system as Gliese 892. Note added in proof. During the refereeing process, we learned about an independent detection by Vogt et al. 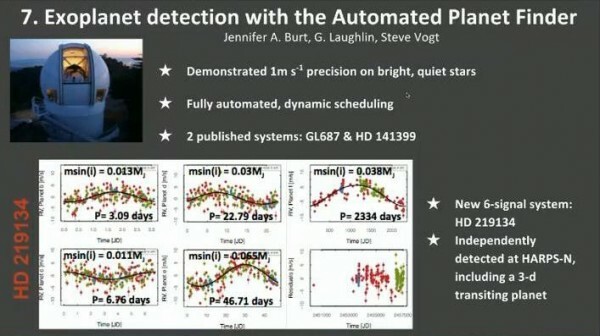 (Laughlin, private communication) reporting additional planets in the system, based on long-term radial velocities obtained with the Keck and APF telescopes.